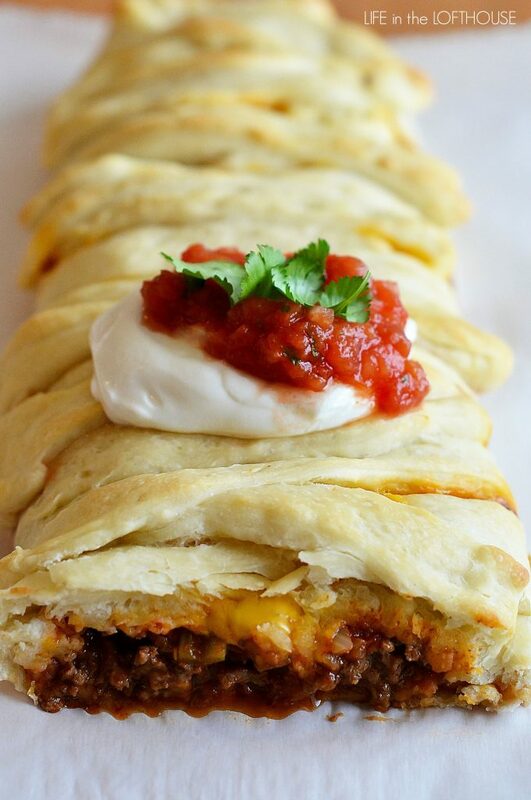 Make dinner extra special with this amazing Taco Braid! 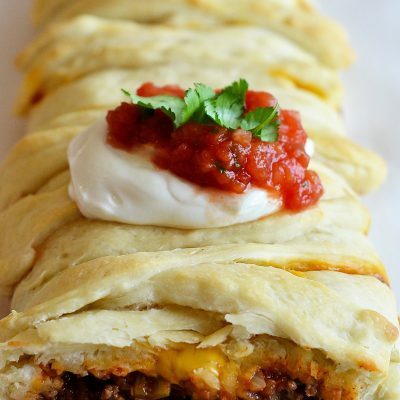 It’s filled with seasoned ground beef, beans and cheese wrapped up in flaky, buttery pizza dough. 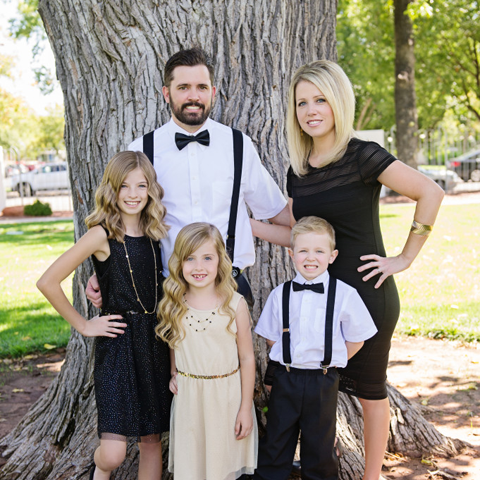 The entire family will devour this one! I received so much positive feedback on my Chicken Fajita Braid I figured I should play around more with these ‘braids’. These yummy pizza dough braids are so easy to make and the varieties you could make are endless! 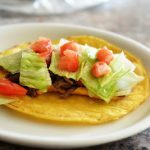 This time I chose to go with a southwest style braid and turned it into a taco! 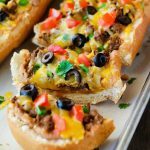 🙂 This Taco Braid version was so delicious and such a big hit with my kids. This amazing Taco Braid is filled with taco seasoned ground beef, refried beans, freshly grated cheddar cheese and salsa! I love that it’s wrapped up in warm, flaky, buttery pizza dough. We dipped each bite into ranch (my kids can’t live with out ranch dressing) and extra salsa. Oh, and don’t forget the sour cream. Guacamole or any taco topping would be so great with this. 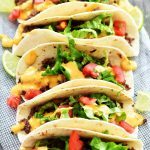 What I loved the most is that it was such a fun twist on regular old tacos. It really is a cinch to whip up and will make Taco Tuesday night extra special! 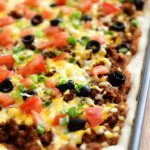 Pizza dough braided around seasoned ground beef, beans and cheese! Unravel pizza dough and let rest on a greased cookie sheet while you brown the ground beef. Cook beef in a large skillet over medium high heat. Drain grease. Add taco seasoning and 1 cup water. Mix well and simmer for 5-10 minutes on low heat. Now that dough has rested and room temperature, shape into a large rectangle. Using a pizza cutter or knife, cut one inch strips down along sides of dough. Spread the refried beans down the center of dough. Spread the seasoned ground beef on top of the beans, and then drizzle the salsa over the meat. Sprinkle the cheese evenly over the top. Now start braiding the one inch strips over the top. Bake at 375 F° for 20 minutes or until golden brown! Let cool 5 minutes before slicing and serving. Enjoy! I tried this taco braid receipe and I thought it was absolutely delicious…my braid didn’t turn out nearly as pretty as your braid did but practice makes perfect. I love this recipe. Yours looks so scrumptious!!!! 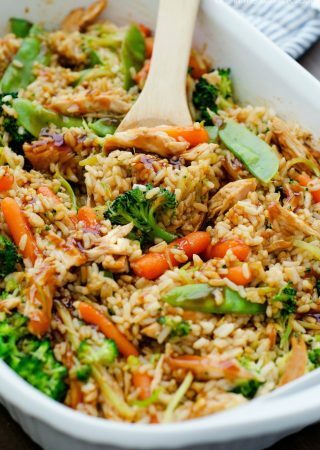 That looks like a delicious and easy dinner! Also, a great use to use leftover taco meat (which I always seem to make too much of). Hey thanks for the add on Tasty Kitchen! I just came here to check out your blog and wanted to add a bit to this recipe– another great version is to smear the bread with cream cheese and add deli meats and veggies. Just toss stuff on and braid it up. I slice up pieces for my son’s lunches and he loves it. You can also do it ‘cinnamon roll’ style and make them like pinwheels- very pretty. 🙂 I am definitely going to try this taco version though.. looks great. I do this same recipe with less water, and add black olives. I mix it up rather than layer it. I use cresent rolls in a sunburst shape then pull the edges round to make a ring, similar to the Pampered Chef ham and broccoli ring, but with taco fixings. I made this for dinner tonight. It was such a hit, I had to make a second one! Anyone know if you could freeze this? I made this yesterday and it was so good! I used less beans because it kind of overpowered the other tastes. I also used pillsbury thin crust and it didn’t need to be rolled out. Next time I think I’ll add some hot sauce and corn and black beans! I love this recipe. I added corn and cream cheese and used wheat pizza dough and it was delicious! oh my gosh, i made this last nite and it was delicious!!!!! !